1. You can add a sitter's profile to your favourites from the search page or from the sitter's profile page. Simply select the heart icon. 2. To view all of your favourite sitters, head to your Dashboard and scroll down to view Your Favourites. Note: If you don't have any favourites, you won't see this section on your Dashboard. 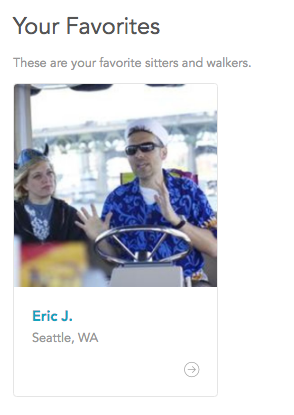 See above for instructions on how to add sitter profiles to your favourites. 1. Access your Dashboard by selecting your name in the upper right corner of the page. Select Dashboard. 2. Scroll down to Your Favourites. 3. Select the arrow icon beneath the sitter you'd like to view or contact. 2. Scroll down to Your Favorites and select the arrow icon beneath sitter you'd like to remove. 3. Once on the sitter's profile, select the heart icon to remove it from your favorites.